Grade 1 stakes winner Poseidon's Warrior, sire of Grade 1-winning juvenile Firenze Fire, has joined the stallion roster at John Phillips' Darby Dan Farm in Lexington to stand the upcoming breeding season after relocating from Pleasant Acres Farm in Ocala, Fla., it was announced on Sunday. By emerging sire of sires Speightstown and bred on the same cross as Smart Strike, Poseidon's Warrior is produced from the multiple stakes-producing Smarten mare Poised to Pounce and boasts 14 stakes horses in his first two dams. He will be offered on Darby Dan Farm's Share the Upside Program and will stand the 2019 breeding season for $6,500 stands and nurses. Winner of Saratoga's Alfred G. Vanderbilt H. (G1) at four, running a 104 Beyer, Poseidon's Warrior won seven races, five of them stakes, by a combined 31 lengths. In addition to winning the Vanderbilt, he also captured the NATC Futurity at Monmouth by seven lengths at two, the East Hanover Stakes and the Le Bagoter Stakes as a 3-year-old, and the Fabulous Strike Handicap at four en route to career earnings of $701,147 for owner Swilcan Stable LLC. Florida's leading freshman sire of 2017 and the only first-year stallion to sire a Grade 1-winning 2-year-old in North America, Poseidon's Warrior is represented in his first crop by last year's Champagne Stakes (G1) and Sanford Stakes (G3) winner Firenze Fire, victorious this year at three in the $300,000 Dwyer S. (G3), the Gallant Bob Stakes (G3), and the Jerome Stakes. He has also sired Navy Commander, winner of this year's Long Branch Stakes at Monmouth Park, and impressive 2-year-old Splicethemainbrace, a 6 ½-length maiden special weight winner. Poseidon's Warrior has taken up residence at Darby Dan and is available for immediate inspection. For more information about Poseidon's Warrior, or to set up an inspection, please contact Ryan Norton at (859) 254-0424 or [email protected] or visit www.DarbyDan.com. 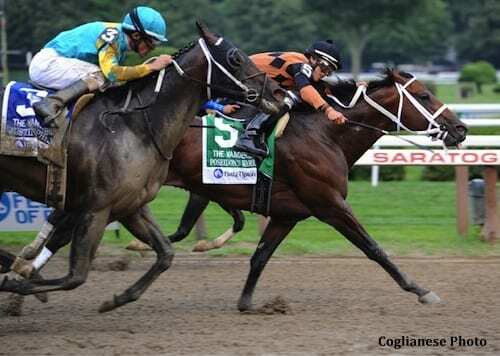 This entry was posted in Bloodstock, NL List and tagged darby dan, darby dan farm, firenze fire, Pleasant Acres Farm, Poseidon's Warrior, Ryan Norton, share the upside, Speightstown, stallion, vanderbilt by Press Release. Bookmark the permalink.